The urge toward unity and dissolution of separation between individuals, organizations, and for some, divinity. The search for underlying cohesive principles of reality, such as physics and mathematics. Since 1998 Neptune has been transiting the zodiac sign of Aquarius. Before we look at this configuration, let’s spend some time looking at the sign Aquarius. Aquarius is also called the water bearer, and is symbolized by an angel pouring water onto the earth. But the water the angel pours is not liquid; it is the water of knowledge. The Greek myth related to Aquarius is the myth of Prometheus, known as the first rebel. Prometheus had been given a mission by Zeus to inhabit the world with living creatures. After creating all the other creatures, Prometheus fashioned a being made to resemble the gods themselves. And as a gift, he taught his favorite creatures astronomy, mathematics, the alphabet, how to cure diseases, and the art of divination. Defying Zeus’ orders, he stole a spark from the sun, fire, and gave it to humans, fire to warm their homes and become the seed of civilization. From this myth, we see the rebelliousness of the Aquarian temperament as well as the desire to uplift the disadvantaged and establish them as equal to the gods. 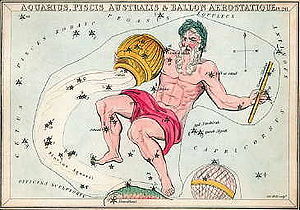 In astrology, Aquarius is known as an air sign. Air signs are concerned with the mind and intellect rather than emotions (water signs), spirit (fire signs), or the physical world (earth signs). The glyph for Aquarius is the lightning bolt, signifying flashes of insight and brilliance. Airwaves and electrical systems come naturally under the influence of this sign and also technological revolutions, such as the industrial revolution in the late 18th and early 19th century and the digital revolution in our time. The sign is also associated with revolutionary ideas, such as liberty, democracy, anarchy, and socialism that topple traditional institutions and is also concerned with the nature of one’s responsibility and contribution to the group. Aquarius includes an egalitarian vision, where each person is created equal to every other, and can make an equally valid contribution to the whole. Craigslist which by providing a free or almost free classified ad environment on the internet effectively demonetized newspaper classified ad revenue, resulting in the demise of hundreds of newspapers and causing a huge transfer of wealth from large corporations to individuals. E-Bay which has become an extreme form of decentralized sales, where millions of items are listed, bought, and sold daily. Google AdWords, whereby advertisers bid for the right to place ads next to Google searches. Quoting a recent article in WIRED Magazine, “By turning over its sales process entirely to an auction-based system, [Google] removed human guesswork from the equation [of what ads would sell given a related query].” Note, “removing human guesswork” means taking emotions out of the equation and basing business decisions on engineering, mathematical formulas, and data mining. Free, or very low cost, access to knowledge and information over the internet. Of course, there are prior examples of this in history, such as libraries, schools, and museums. Wikipedia, the free, open content online encyclopedia created through the collaborative effort of a community of users. Open source software which generally allows anyone to create modifications of the software, port it to new operating systems and processor architectures, share it with others, or market it. No doubt you can think of many more. We are living amidst a huge renaissance of the Aquarian spirit, supported by Neptune’s transit through the sign. I’ll spend the next few posts examining this trend and exploring how to align with it in our business lives. This entry was posted on Tuesday, July 14th, 2009 and is filed under Long-term Planning, Neptune in Aquarius, Philosophy. You can follow any responses to this entry through RSS 2.0. You can leave a response, or trackback from your own site.